Google Talk Gadget for Bloggers. ~ The Blog Doctor. You are here: Home > Google Talk > Google Talk Gadget for Bloggers. Google Talk Gadget for Bloggers. 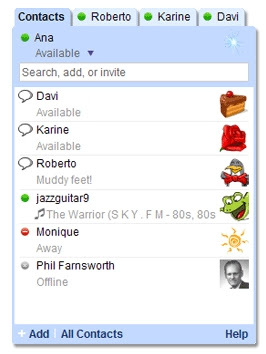 Google Talk is the instant messenger for Google. With Google Talk you can see who is online and send instant messages to them fro your blog. There is no need to install any software. You just have to copy and paste a snippet of code. To add Google Talk Gadget to your webpage go here. Adjust the width, height and border to suit your blog's decor and click on Get Code. Remeber to put the width smaller than the width of your sidebar. To add Friends, simply click on the +Add button in the lower left hand corner of the gadget, and type in the email address or Google Talk username of your friend in the search bar. If your friends already use Google Talk, they will receive an invitation to chat in Talk. If they are new to Google Talk, they will receive an email that will help them sign up. If you cut and paste a video URL from YouTube or Google Video into your chat, and send to your friend you'll be able to watch the video right in the Gadget, and if your friends are using the Talk Gadget, they will too. You can share photos the same way by pasting a URL from Picasa Web Albums. To send an Instant Message or email click on a name to open a chat window. You may have as many chat windows open as you like at one time. Type directly into the box to send an IM. If you're signing into Google Talk with a Gmail account, you can send an email using your Gmail account by clicking on the Email button, or by clicking on the mail icon next to a name directly from your Friends list. To call a friend, click on the Call button from an open chat window. You can also make a call by clicking on the green phone icon next to a name directly from your Friends list. You can have multiple calls underway at once–but only one can be active at a time. The other calls must be on hold. If you have a team blog you can instantly talk with other authors.